By Abi - Chile - 19 Mar/03 - Viewed 1555 times. 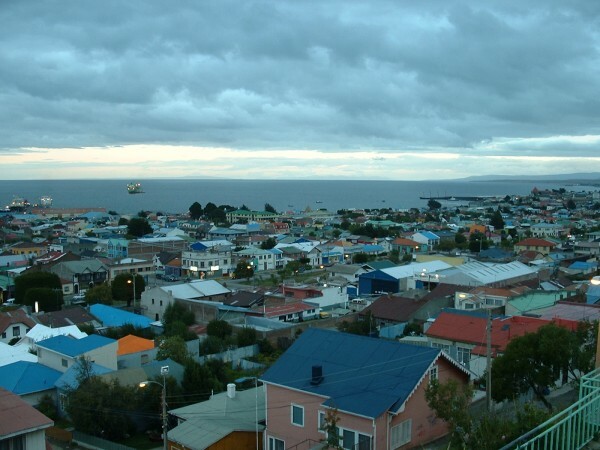 We arrived in Punto Arenas at about 10:00 p.m. According to our guidebook, there were a couple of hotels that were suggested so we went to the closest one we could find. It was full, but the man gave us another name of one close by and even called for us to verify that there was space. When we got to the second one, it was probably the nicest room we have stayed in, and at $22, also the most expensive! We didn�t really mind paying the extra, because the wind was blowing so fiercely and it was freezing, that we didn�t want to be walking around outside in search of someplace where we may or may not save $5. At breakfast, we enjoyed talking with the girl in charge of the house. We had heard about President Bush�s address to the nation, but didn�t know what was said. The girl asked us what we thought of the impending war, and I tried to not get into a political discussion. Eventually she said that in Punto Arenas, everyone was quite worried because it was the only other place besides the Panama Canal through which the U.S. Navy's ships would pass. They didn�t like the fact that they may contain bombs, etc. I could certainly understand their worry. In the morning, we walked around taking a look at the town. There was a neat museum about Jose Menedez, a famous politician. It was small, but one that explained a lot of history about the port city. The building was also his home in the 1800s, and much of the furniture was original. It was quite beautiful and very well done. Although the ticket man told us it would only take half an hour, I think we stayed quite a bit longer than that we enjoyed it so much. Somewhere along the way of just walking around, we ran into some friends we originally met a few weeks ago when we were camping in Parque Nacional de los Glaciares at Mt. Fitz Roy. We chuckled at the fact that we continued to keep running into each other, as we�ve seen them a few times along the way. This time, though, we had thought that our paths would not be crossing again! We enjoyed lunch with them and then headed to another cemetery Travis wanted to check out. On our way there, we came upon a funeral procession. It was a little different than what we are used to. Usually in the States, all the cars follow the hearse to the cemetery. Here, there was only the hearse, and all the people walked along behind it, which I found interesting. Another thing we found interesting was that these plots had little glass enclosures in which loved ones could place keepsakes of the deceased. It seemed that typically there was a small statute of the Virgin Mary accompanied by a picture of the deceased, along with a few other small trinkets. We didn�t stay long, but this cemetery seemed to be better maintained than some of the previous ones we have visited. One thing I must mention is the air pollution here. It is terrible! I am certainly glad for the emissions testing that we have in the States. Here it feels like you can feel your life getting shorter every time you take a breath! The next morning, we caught the bus at 7:30 for the long trip to Ushuaia, which would last about 14 hours. We arrived about 9:00 p.m. and made our way to the Tourist Office, got some information on a place to stay and got directions. Unfortunately, the map was mismarked, but after some time and asking several people, we located a nice family run hotel. I'm excited to see what the end of the world has to offer us!